Barcelona is a mesmerizing seaside Spanish town, bursting with culture, world class food and drink and – of course – magnificent architecture. With so much to see and do, it’s really hard to decide what to see, especially if you have just one day. Barcelona and its Catalunyan architect Antoni Gaudí are practically synonymous, partly because the creative genius hated to travel and hence built most of his works in or near the city. This turned out to be a blessing for tourists: UNESCO has recognized seven works of Antoni Gaudí for their uniqueness and artistic value and inscribed them on the World Heritage List. Follow our itinerary and you'll see four of them. No, that's not a misspelling of gaudy: Antoni Gaudí was a famous architect in Barcelona. It's hard to miss his very odd buildings, bright and colorful yet strangely shaped with wavy lines and deep curves. Reminded us of the “tequila building” (F&F Tower) in the banking district of Panama City, Panama. Did Gaudi have one too many glasses of tinto de verano while designing? Actually, no. Gaudi's theory was that “Color in certain places has great value of making the outlines and structural planes seem more energetic.” He also said, ”Those who look for the laws of Nature as a support for their new works collaborate with the creator.” So I guess it wasn’t Spain's great wine that led to the curving and winding facades, it was actually planned. 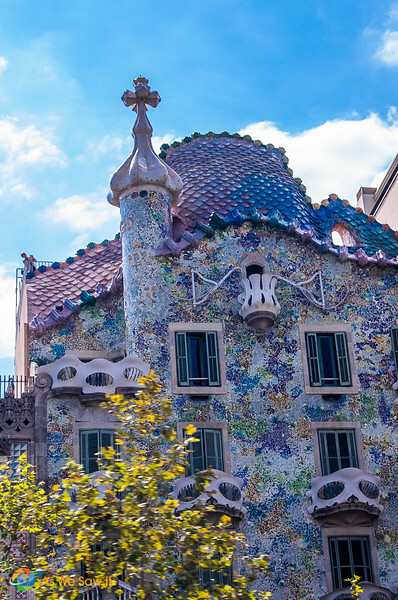 It would seem that he succeeded in bringing energy and nature of the creator to the aspects of his buildings, which is why Gaudi’s buildings have earned that coveted World Heritage status. One day in Barcelona … or not. We spent three days and two nights in the city, beginning with a hop-on Hop-off bus tour. We find them a great to get a better idea of Barcelona's layout of the city and what she has to offer. Unfortunately, not everyone has that luxury (I'm looking at you, cruisers!). Just in case you have only one day in Barcelona, we’ve put together a list of the best things to do, organized into an easy itinerary. We had a great time and want to help you make the most of your visit as well. Our focus is always on squeezing as much culture, UNESCO sites, and food as you can into whatever time you have. On the other hand, maybe you'll be in Barcelona longer or you're not into rushing around. There's nothing like having time to explore, visit the Picasso Museum, or take a day trip. Hey, it's your adventure, so read through our activities and pick and choose as you wish. We've even got a lot of extra things to do in and around Barcelona in our resources section at the end. Maybe a day trip out of town. If you're up to the challenge to fit everything into one day though, be sure to begin nice and early … and wear good shoes! Tip: Barcelona tourism board offers a discount tourist card called the Barcelona Card. It gives you unlimited transport, a museum pass and discounts. Learn more here. Shopping heaven. Sometimes called Las Ramblas, La Rambla is a mile-long street in the center of Barcelona, popular with locals and even more so with tourists. Lined with cafes and souvenir stalls, this street is the center point that leads to and connects many of the other popular tourist attractions. It runs from Barcelona Harbor to Placa de Catalunya. Breakfast: A highlight of La Rambla is Mercat de la Boqueria, a large public market that has been going strong since 1217. This is a foodie’s paradise, maybe the best place to sample some of the finest food that Catalonia has to offer. It certainly makes a great place to grab a quick breakfast or buy a picnic lunch (hint, hint)! Tip: If you enjoy local markets, Get Your Guide offers an interesting tour of two markets with a chef that includes food tastings. After breakfast, stroll to Barcelona's nearby Gothic quarters. Barri Gòtic is a maze of small streets which are closed to traffic – many of which open out into quaint town squares. While many of its buildings date from medieval times, some are actually even older, dating back to the Roman settlement of Barcelona. If you have the time and are in town for several days, consider spending at least half a day here. There is so much to see and take in. If you're only spending one day in Barcelona, then zoom through this area so you can also fit in Parc Guell (which also deserves half a day). If you wear good shoes, you won’t regret it. Plaça del Rei – where you will find the Barcelona History Museum. Barcelona Catédral – The Cathedral of the Holy Cross and Saint Eulalia is the top sight in the Quarter, built between the 13th and 15th centuries. This cathedral is dedicated to Eulalia, the co-patron saint of Barcelona, who suffered martyrdom during the Roman times in the city. 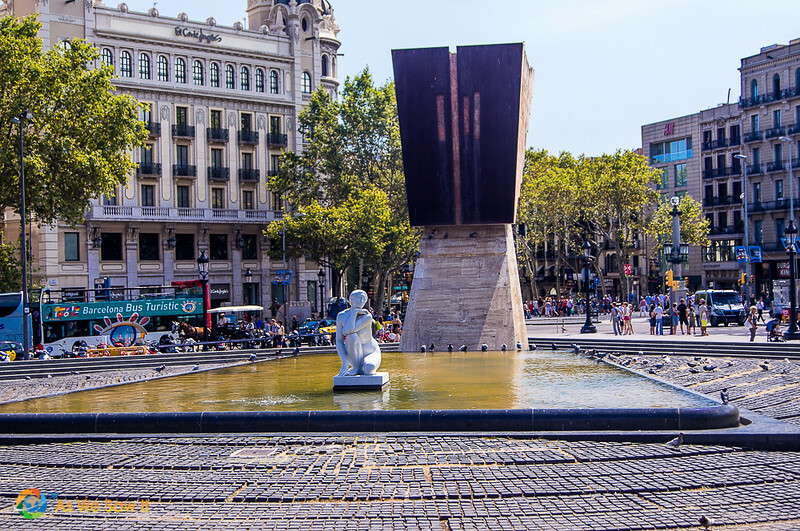 After whizzing through the Gothic Quarter, walk to the top end of La Rambla, where you will find yourself at Plaça de Catalunya. This circular plaza is a landmark and the cultural hub of Barcelona. It offers stunning fountains and sculptures and is a great place to relax, take pictures, people watch and listen to the Latino Buskers. It’s also well known for its flocks of pigeons which gather in the center. Tip: Plaça de Catalunya gets increasingly crowded and “colorful” as the day goes on. 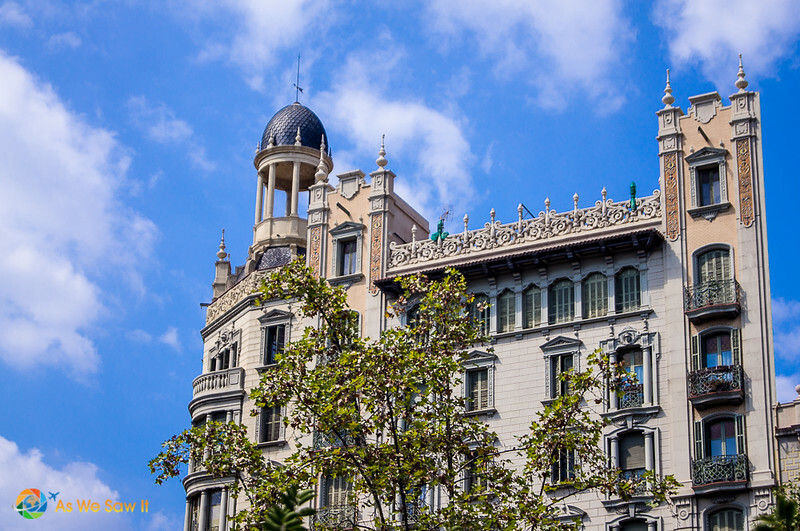 In the early 20th century some of Barcelona's most important Modernista architects – including Lluís Domènech i Montaner, Josep Puig i Cadafalch and Antoni Gaudí – all ended up designing radically different buildings on the same city block. The buildings clashed with each other and the neighborhood so much that the block was nicknamed Illa de la Discòrdia (Block of Discord). As you’d expect, this city block is a major tourist attraction in Barcelona. Tip: If you're only in Barcelona for a day, enjoy at these buildings from the outside and save interior visits for another time. Better known as La Pedrera (the quarry), Casa Milá was built between 1906 and 1910 and was designed by the famous Catalan architect Antoni Gaudí (1852-1926). This building earned its nickname because of its resemblance to an open quarry. 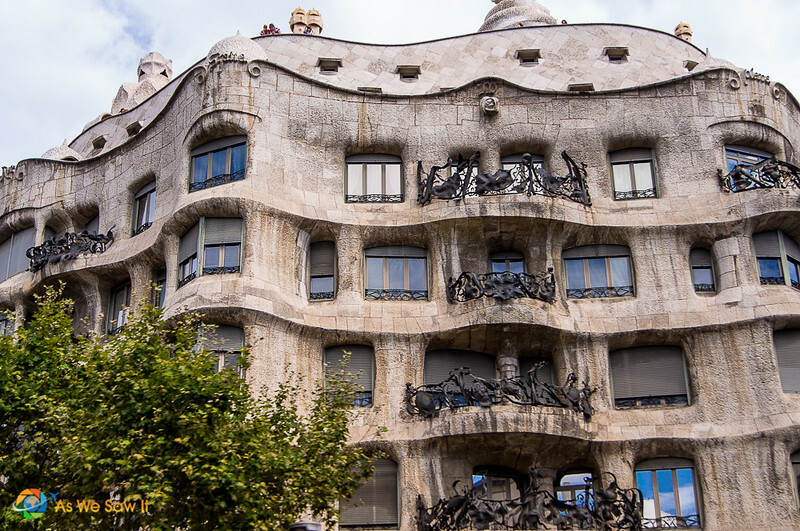 Though it was originally a house, today Casa Milá is used as the headquarters of the Catalunya-La Pedrera Foundation, which manages its exhibitions, activities and public visits. is another piece of Gaudí-designed architecture and is a remodel of previously built houses. 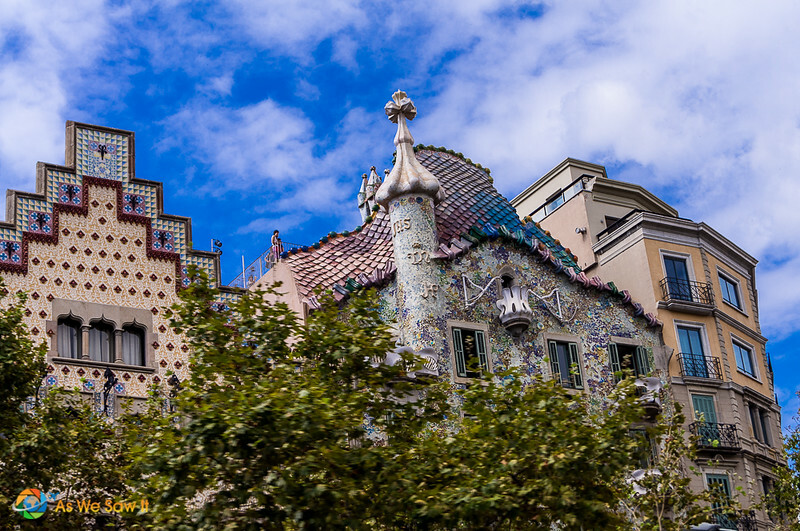 Famous for its dragon-style roof, it is now a museum dedicated to Gaudí himself. With its unusual tracery, irregular oval windows and flowing sculptured stone work, you can see why this building is branded a masterpiece. Buy tickets here. Standing just to the left of Casa Batlló and striking for its stair-stepped facade, Casa Amatller was originally designed as a residence for chocolatier Antoni Amatller. It was constructed between 1898 and 1900. It is now a museum which is often less crowded than the other Casas on the street, and has a lovely café located on the ground floor of the building. Architect Lluís Domènech i Montaner remodeled the Morera family home, adding galleries and stone balconies to the façade and making it a truly modernist work of art, both inside and out. He included frequent allusions to the family's surname (Morera means mulberry in English) through the use of different materials, and added symbols of 20th century inventions. Rather than send you in search of a particular restaurant, we recommend that you save time and energy and stop to eat whenever you get hungry. As the biggest meal of the day, lunch is a serious activity in Barcelona. Restaurants serve lunch from 1:30 to 4 pm, and lines can get long. If you visit a popular place, be prepared to wait. We had lunch at the Hard Rock Cafe because each one has a ‘local flavors' burger and we enjoy trying them. 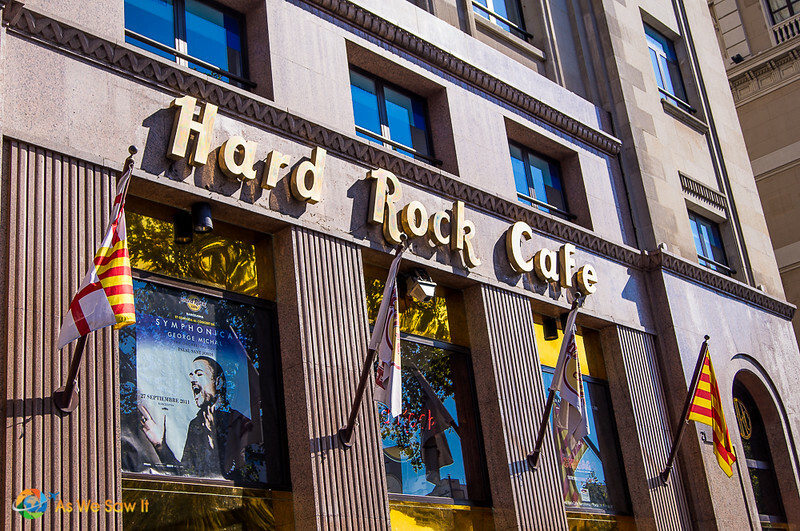 Plus, we like to take photos of Hard Rock Cafes around the world. It's one of our little quirks. If you're a fan, you can get priority entrance along with an affordable meal by using this link. Parc Güell deserves at least a half day to really appreciate, so be prepared. Parc Güell is one of Gaudí’s major works, created during his naturalist phase (meaning, he found his inspiration in organic shapes). It is a public park and a favorite with adults and children alike, partly because of its fairy tale-like Hansel and Gretel houses at the entrance (one is a small museum). Oozing with fascinating buildings, stone structures and beautiful colored tiles, we have learned – after having missed it due to time – that this artistic park is one not to be missed. Big regret. Tip: This place is huge so keep a careful eye on your watch. 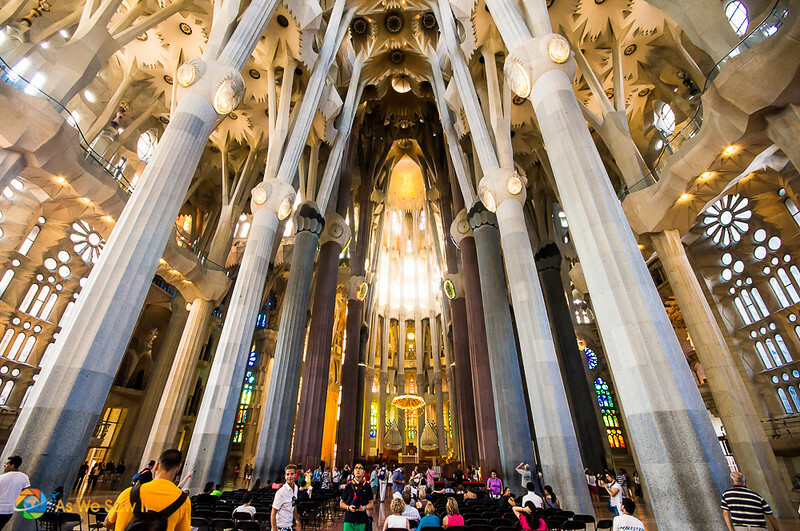 This is especially important if you have a ticket to see Sagrada Família at a specific time. It will take about 30 minutes to get to Sagrada Familia from here, so rest your feet for that time and take the Metro to your next stop. Begin at “Lesseps” (Green Line, L3) and cross the city to the “Sagrada Família” stop (Blue Line, L5). This is the most popular attraction in Barcelona. 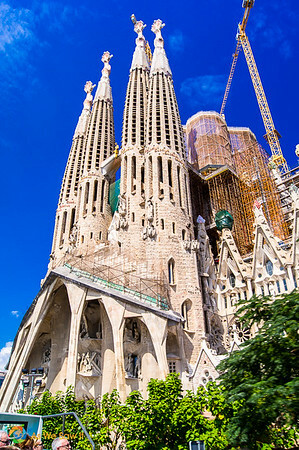 Abandoned for decades and still unfinished, the large Roman Catholic Sagrada Família cathedral is Gaudí’s crowning achievement. Construction started in 1882 and by the time Gaudí was killed by a tram in 1926, less than a quarter of the project was complete. Construction was interrupted by the Spanish Civil War and resumed in the 1950s. The construction relied on private donations and ticket sales so its building progress has been extremely slow. In October, 2015, the breathtaking cathedral began its final phase, erecting six immense towers that will make it Europe's tallest religious building. 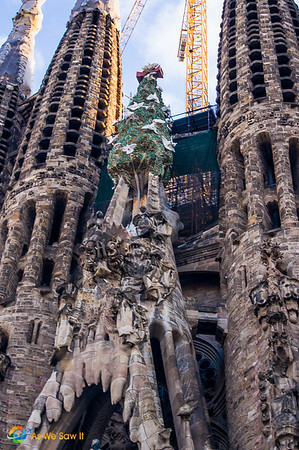 They hope to complete it by 2026, the 100th anniversary of Gaudí’s death. No matter where you look, the cathedral holds details of the Gospel message. Interesting fact: Gaudí is buried in the cathedral; his tomb can be viewed in the downstairs crypt. Tip: There are likely to be fewer crowds in early morning and late afternoon. These times offer an additional bonus: The low hanging sun will be shining through the cathedral’s stunning stained glass windows and will cast brilliant colors upon everything inside. Buy a fast-track ticket ahead of time to avoid the extremely long ticket lines. 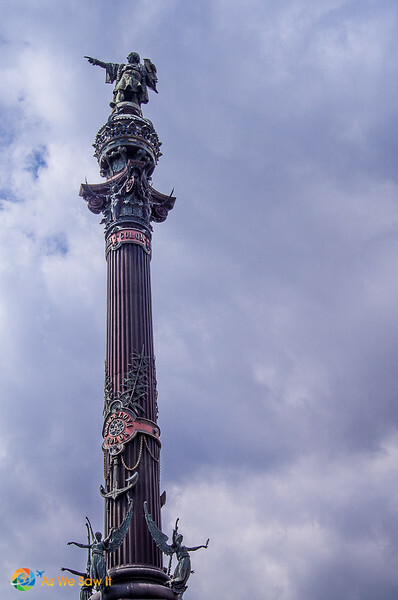 Built in 1888, the Columbus Monument (Mirador de Colom) proudly stands at the seaside end of Barcelona's Rambla. It is a 60-meter-high tribute to Christopher Columbus, who was funded by Spanish royalty (Ferdinand and Isabella) and chose to disembark at the port of Barcelona when he returned from his voyage to America. Tip: You can buy a ticket to the viewing gallery at the top for marvelous views of the harbor and surrounding area. 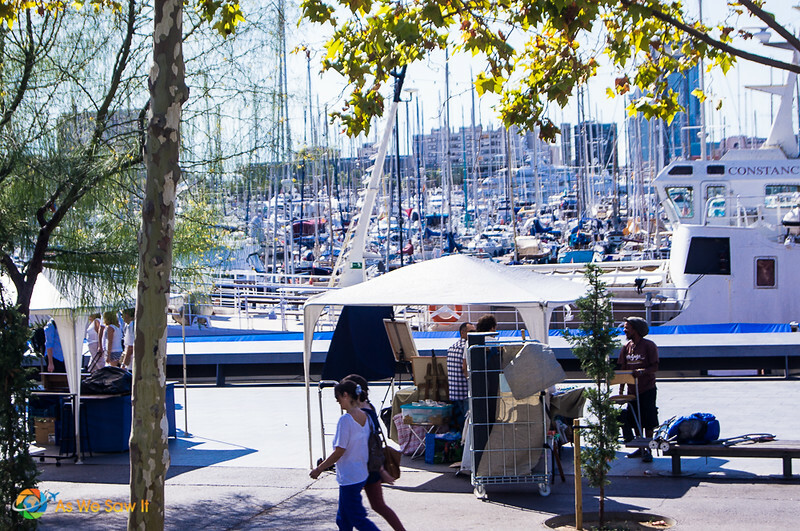 Finally, when your tired feet are screaming “Enough!” and your empty tummy is complaining, head to Barcelona's marina. (Relax: It’s only steps from the Columbus Monument.) There are plenty of restaurants and cafes to choose from and it is a perfect spot to chill out. We'll be honest: We've never been able to hold out long enough to eat with the locals. See, the traditional dining hour in Spain is 10-11 pm. If you're like us and don't want to wait until the locals are ready for dinner, you can either have an early dinner in the tourist area or join in the Spanish after-work tradition, tapas. To be honest, when we're in Spain, we fill up on tapas and forget about dinner. Anyway, jutting into Barcelona's marina is a hard-to-miss shopping mall called Moll d'Espanya-Maremagnum. It has a variety of restaurants as well an imposing aquarium – perfect for the kids. We found one that looked appealing and enjoyed our tapas while watching the boats. Here are some resources to help you plan your own trip. Want to see more of this destination? Check out our Barcelona photo gallery. Currency questions? This website will help you calculate currency exchange values. Travel insurance covers lost bags, delays, injuries, and more. Here’s one to look at. We recommend using HotelsCombined to make your lodging arrangements. You can check prices and read reviews before you book. Very reassuring. We stayed at Onix Liceo. It's in a very convenient location, next to Gaudi’s Palau Guell and only 300m from Liceo Metro Station on Barcelona’s Ramblas. The hotel offers a sun terrace and free Wi-Fi access. The closest airport code is BCN. Find and book a rental car at com. The company is affilated with Booking.com so you know they are reliable. For other options, this websiteshows how to get anywhere by plane, train, bus, ferry and car. Barcelona looks inspired Linda. Phenomenal post. Hey thanks, Ryan. We think it’s a Spanish paradise. Maybe not on the level of Andalucia, but that beach sure is sweet. Huge thanks for all the ideas!. I’m currently planing to travel to Spain next summer and I think I will use your list as a guide to doing things in Barcelona. It’ll be amazing I’m sure! You’re welcome. I do hope you will enjoy your trip. We absolutely adore Barcelona and can’t wait to get back! We really need to, because we barely got to half of your list during our day there! 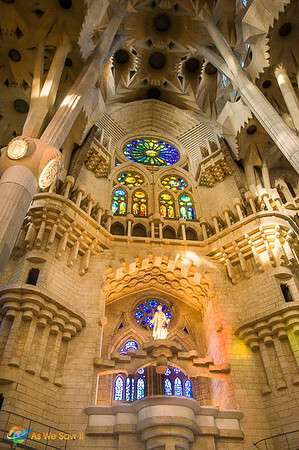 Of course, we could spend a whole day – or longer – exploring Sagrada Familia. So pretty! We have the same issue, Rob. We couldn’t fit Parc Guell into our itinerary, except for a drive-by. So yeah, must go back! I spent a semester studying in Madrid and went to Barcelona toward the end of it. Madrid was a fantastic city in which to live, but Barcelona was just incredible! Unlike any other place I have visited. La Sagrada Familia and Parc Guell are the two things I remember most. I hope one day to return there. I’ll definitely be referencing this post when I do! We were surprised at how different the Madrid and Barcelona vibes are. How much time were you able to spend there? I hope you get a chance to visit, Kacy. It is a great city, especially because it’s got beaches!